A popular resort town offering a good range of tourist trips, activities, and amenities, Seminyak houses numerous tour companies providing excursions into the jungles of Bali. Explore the numerous day-trip ideas around Seminyak: Uluwatu Temple (in Pecatu), Tanah Lot Temple (in Beraban) and Jimbaran Bay (in Jimbaran). There's still lots to do: make a splash at Waterbom Bali, get your game on at Tilo Kids Club, head outdoors with SeaBali, and kick back and relax at Nusa Dua Beach. To see ratings, other places to visit, photos, and other tourist information, go to the Seminyak trip itinerary planner. Tel Aviv, Israel to Seminyak is an approximately 20-hour flight. The time zone changes from Israel Standard Time to Central Indonesia Time, which is usually a 6 hour difference. August in Seminyak sees daily highs of 34°C and lows of 28°C at night. Cap off your sightseeing on the 9th (Fri) early enough to go by car to Ubud. Experience small-town Bali in Ubud, an atmospheric town surrounded by small settlements, farms, and rice paddies. Explore Ubud's surroundings by going to Ulun Danu Bratan Temple (in Tabanan), Elephant Safari Park (in Tegalalang) and Tirta Empul Temple (in Tampaksiring). And it doesn't end there: identify plant and animal life at Sacred Monkey Forest Sanctuary, examine the collection at Setia Darma House of Mask and Puppets, make a trip to Tegalalang Rice Terrace, and take in the spiritual surroundings of Saraswati Temple. To see photos, other places to visit, ratings, and other tourist information, go to the Ubud trip site . Ubud is just a stone's throw from Seminyak. In August, daily temperatures in Ubud can reach 34°C, while at night they dip to 28°C. Wrap up your sightseeing on the 14th (Wed) to allow time to drive to Amed. A snaking coastline and quaint, sleepy fishing villages characterize Amed, a stretch of shorefront with seven villages in Bali's east. Explore Amed's surroundings by going to Guungan Hill (in Candidasa), Mendira House (in Manggis) and Karangasem (Besakih Temple, White Sand Beach, & more). The adventure continues: see some colorful creatures with a scuba or snorkeling tour, take in the awesome beauty at Mount Agung, don't miss a visit to Lempuyang Temple, and take in the exciting artwork at Amed Art Gallery. For maps, traveler tips, reviews, and tourist information, go to the Amed tour itinerary planner . Getting from Ubud to Amed by car takes about 1.5 hours. Other options: take a bus. Plan for little chillier nights when traveling from Ubud in August since evenings lows in Amed dip to 24°C. Wrap up your sightseeing on the 17th (Sat) to allow time to travel to Nusa Lembongan. The island of Nusa Lembongan sits amidst swathes of calm, clear waters as well as some of the most notable surfing waves in the region. Spend the 18th (Sun) among aquatic life with a scuba or snorkeling tour. 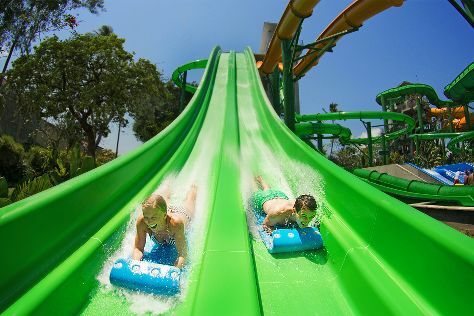 Plan for a day of cool, family-friendly fun on the 21st (Wed) at Sunday Beach Waterpark. There's lots more to do: look for all kinds of wild species at Devil's Tears, explore and take pictures at Seaweed Farming, Nusa Lembongan, indulge in some personalized pampering at some of the best spas, and take a peaceful walk through Mangrove Forest Nusa Lembongan. To see ratings, other places to visit, maps, and more tourist information, refer to the Nusa Lembongan trip itinerary app . You can do a combination of taxi and ferry from Amed to Nusa Lembongan in 2 hours. Alternatively, you can do a combination of bus and ferry. Traveling from Amed in August, Nusa Lembongan is somewhat warmer at night with lows of 28°C. Finish your sightseeing early on the 21st (Wed) so you can travel back home.